Green technologies are no longer the “future” of science, but the present. With more and more mature industries, such as the process industries, making large strides seemingly every single day, and more consumers demanding products created from green technologies, it is essential for any business in any industry to be familiar with the latest processes and technologies. It is all part of a global effort to “go greener,” and this is nowhere more apparent than in fermentation technology. This book describes relevant aspects of industrial-scale fermentation, an expanding area of activity, which already generates commercial values of over one third of a trillion US dollars annually, and which will most likely radically change the way we produce chemicals in the long-term future. From biofuels and bulk amino acids to monoclonal antibodies and stem cells, they all rely on mass suspension cultivation of cells in stirred bioreactors, which is the most widely used and versatile way to produce. Today, a wide array of cells can be cultivated in this way, and for most of them genetic engineering tools are also available. Examples of products, operating procedures, engineering and design aspects, economic drivers and cost, and regulatory issues are addressed. In addition, there will be a discussion of how we got to where we are today, and of the real world in industrial fermentation. This chapter is exclusively dedicated to large-scale production used in industrial settings. 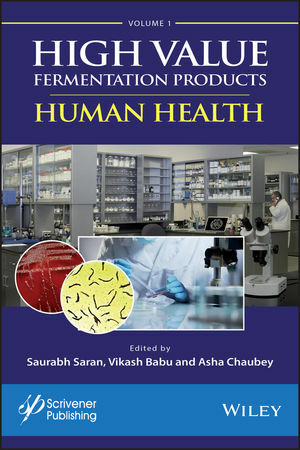 Saurabh Saran, PhD, is a microbiologist and fermentation scientist with over ten years of experience in industrial microbiology, biotechnology and fermentation technology. He received his doctorate from Delhi University, and he has extensive experience in both the academic and industrial worlds, in multiple countries. He is currently Senior Scientist in the Fermentation Technology Division at the Indian Institute of Integrative Medicine, Jammu. He has three patents and more than 25 international publications in peer reviewed international journals on fermentation technology to his credit. Vikash Babu, PhD, has a doctorate from the Indian Institute of Technology and has over ten years of experience in graduate and postgraduate work and teaching. After working at Mangalayatan University and Graphic Era University, he joined the Indian Institute of Integrative Medicine as a scientist. He has been the editor on one book, also available from Wiley-Scrivener.